Biba Isla Boutique Salon offers personalized services beyond the ordinary. Experience an escape when you desire exclusivity. As a Rene Furterer partnered salon, we believe in using only the finest products for hair and skin. We use holistic healing techniques for chakra healing and balance removing negative energy in a non-toxic environment. Biba Isla Boutique Salon is a place of tranquility for guests embracing a sophisticated style. You deserve the extraordinary. New Orleans History Tours now available. All reservations must be completed online. Same day sessions are limited so please reserve 24hrs in advance. New Orleans history Tours now available! Biba Isla's Signature products are Cruelty Free. A portion of service and products sales are donated to St. Jude Research hospital. 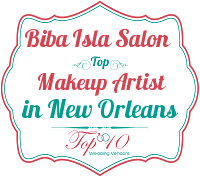 ﻿﻿﻿﻿﻿﻿﻿﻿﻿﻿﻿﻿﻿﻿Biba Isla Boutique Salon is located in New Orleans Warehouse district. It is the finest salon in the city when you desire exclusivity with personalized service and products. Wellness services: Biba Isla Boutique Salon offers customized scalp & hair treatments using Rene Furterer hair products made from all natural ingredients. For more intense treatments, Biba can customize a formula for your scalp or hair issues. Scalp massages include Chakra balance and healing to remove negativity and promote clear thinking and reduce stress. Biba Isla Boutique salon becomes your own personal space where you have a personal service provider. Once you become a client of Biba Isla, you have a personal hairstylist/makeup artist on call seven days a week. Groups: We offer space for wedding parties or a place to get ready for a night out to come in for hair or makeup sessions. Appetizers available upon request, complimentary beverages available for all guests. You are welcome to get dressed or do your own makeup if desired. We also go on location in New Orleans, New York, West Hollywood and Miami, and Dallas. Non-Toxic environment: We do not use harmful products. Unlike other salons with multiple stylists doing services at the same time, you are the only one in salon. You will not inhale poisonous fumes from chemicals like methyline glycol and formaldehyde in Keratin, Brazilian blow out products. Because these chemicals are released into air and air vents, we do not use these products to ensure the health and safety of each guest. Reservations/Sessions: All sessions must be reserved online with major credit card, we do not AMEX at this time. You will be greeted at your exact session time, so we ask that you do not arrive early to ensure guest before you gets their full session and I have time to clean and sanitize tools.